There is an inner experience that is driving your teen’s behavior, and my goal is to help uncover and address it. Helping teens who are experiencing emotional reactivity requires more than just receiving a description of their behavior. For example, symptoms of emotional overwhelm can be seen in kids being bullied, families whose parents are undergoing separation/divorce, kids witnessing parental conflict, experiencing parent-child conflicts, or undiagnosed learning challenges. 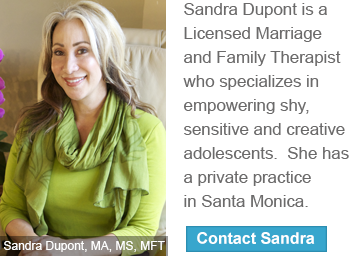 The reason I offer a FREE Initial Parent Consultation is to confirm that I am a good match for your family. My intention is to guide you in ways you can support your teen, with the focus on solutions that will unite the family rather than assigning blame. During this time, you will get an immediate and direct experience of the value I provide. It is important to interview both the parents and teen, asking a range of questions about the teen’s health and early development, family dynamics, and school related issues. From this thorough initial interview, it can generally be determined if other specialists may need to be considered in addressing the cause(s) of the teen’s challenges, in order to turn this situation around. My world travels and work as a teen therapist have exposed me to people of many backgrounds. What I have learned from my experiences both abroad and locally, is that we are not different in matters of the heart. Thus, the pervading theme of my work has been encouraging the practice of kindness and understanding within our families and communities.